The tenth Doctor's star-crossed epic continues, as allies become enemies in an interstellar arena! Plus, the Doctor, Gabby and Cindy face off against the terror of the Wishing Well Witch as Gabby and Cindy's first trip to the UK turns deadly in a small, superstitious town when an ancient evil is resurrected! 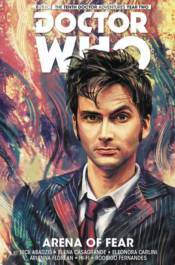 Collects Doctor Who: The Tenth Doctor Year Two #6-10.